Antonie Radler (20) contracted the Spanish Influenza in 1919 and was gravely ill. 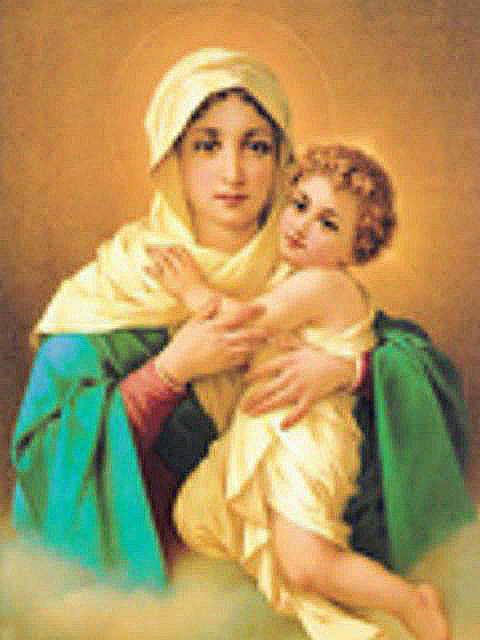 Her mother prayed desperately to the Blessed Virgin for help. Suddenly, Blessed Mary appeared at her bedside and laid her hands upon the young victim. Antonie was instantly healed. Fully recovered, Antonie was working one day in her father’s butcher shop when the Gestapo arrived and ordered her to replace the painting of the Virgin on the wall with that of the Fuhrer, Adolf Hitler. She was also ordered to salute him in the Nazi fashion, saying, “Heil Hitler.” Antonie refused and barely escaped several attempts upon her life. She always maintained that her Guardian Angel – in the form of a mysterious cyclist – protected her. A second appearance of the Blessed Virgin happened to a young girl named Cecilia Geyer on February 22, 1938. It was about 6:30 a.m. when Cecilia heard a “murmur” and then saw Our Lady appear in a bright cloud. “Build a chapel here for me. I shall trample underfoot the serpent’s head. People will come here in large numbers, and I wll pour upon them a flood of graces. St. Joseph, St. Anthony, and the souls in Purgatory will help you. Realizing that all the churches were closed at that hour, Cecilia asked Mary where should she go? Work began on the chapel on July 2, 1938. All went well until the night of November 21, when Antonie was arrested by the Nazis and jailed in the local prison. She underwent numerous interrogations. On the night of December 7-8, Antonie witnessed a large bright cloud forming and rising in her jail cell. Suddenly, the Virgin Mary appeared to her and announced her impending release. She would spend Christmas with her family; Antonie was indeed released on December 18, the Feast of the Expectation of Our Lady.